P.S. Making Light In Terezin tells another chapter of Jewish people during World War II. Though it’s about people who use humor and entertainment to help them survive —it’s still a film about wounded souls. A few mountaintop experiences in my life include seeing one full solar eclipse in Salzburg, winning two Regional Emmy’s in Minneapolis, and scoring three touchdowns in a high school football game in Florida. 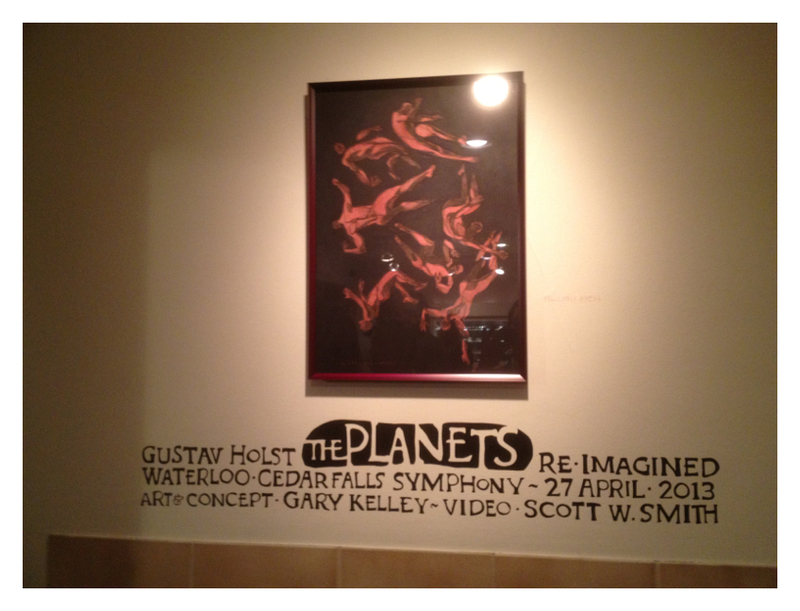 That’s an eclectic mix, and there have been others of course, but those came to my mind Saturday night as I was brought up on stage after the debut of The Planets: Re-Imagined featuring the artwork of Gary Kelley, the music of Holst performed by the Waterloo-Cedar Falls Symphony and a choral group from the University of Northern Iowa. All brought together under the direction of conductor Jason Weinberger. 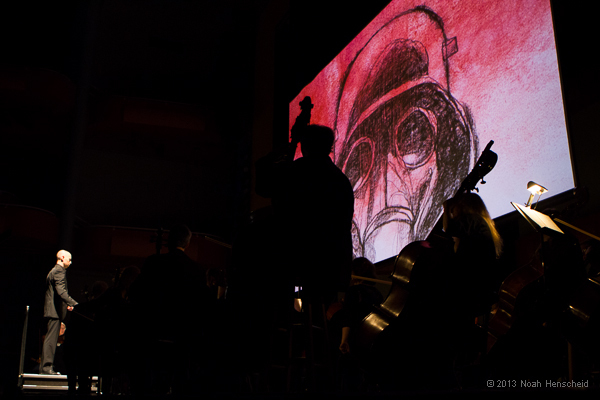 My role was to create the video along with Kelley which was projected in high-definition on the 30 foot wide-screen just above the orchestra at the Gallagher Bluedorn Performing Arts Center in Cedar Falls, Iowa. Standing on stage and looking up at more than 1,200 people applauding something you worked on is an amazing experience by itself. The concert was a great experience and I hope in the coming years The Planets: Re-Imagined finds its way into concert halls throughout the United States and even around the world. 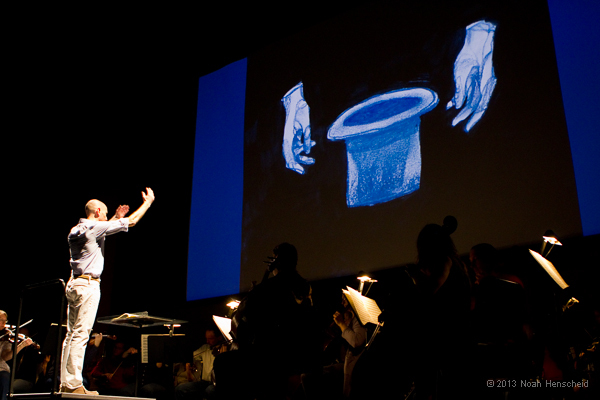 Jason Weinberger is not only the conductor of the WCFSO but the its artistic director and CEO as well. Raised in Santa Monica and educated at Yale and Peabody, Weinberger has quite a vision and hope for the future of symphony music and education. It was a special night and I was thrilled to be connected with so many talented people. 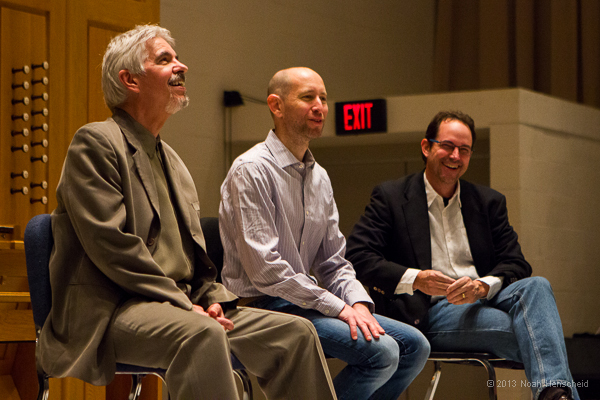 Below are some photos of the concert (and a rehearsal and pre-concert talk) taken by Noah Henscheid a photographer from St. Paul, Minnesota. P.S. If you’re unfamiliar with Gary Kelley’s work, there’s a good chance you’ve at least seen his art—if you’ve ever been to a Barnes & Noble book store. 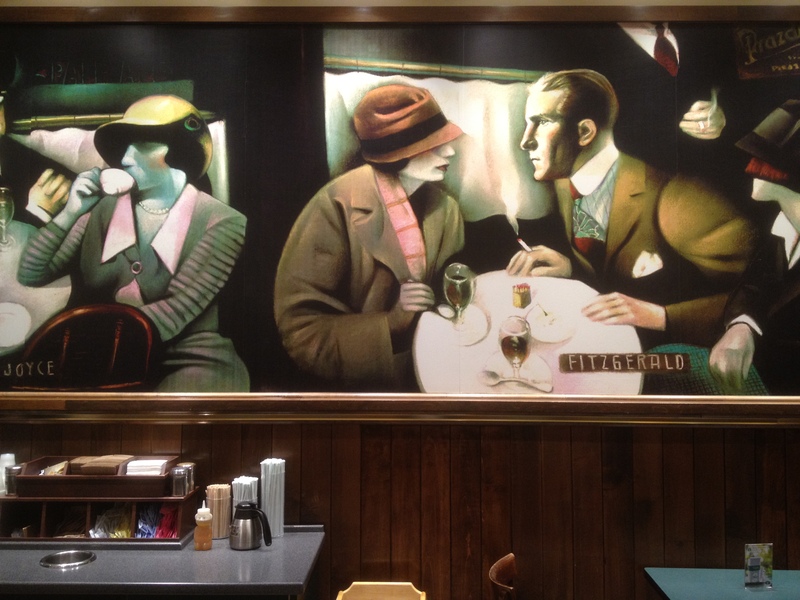 Since there’s about to be a revival of author F. Scott Fitzgerald due to the release of the movie The Great Gatsby next month, here’s a photo I took at a Barnes & Noble/Starbucks of Fitzgerald that is part of the mural of writers that Kelley painted. (Actually taken in the Twin Cities not far from where Fitzgerald was born and raised.) Kelley is repped by Richard Solomon in NYC. Here’s a promotional video for a project I finished editing this week with artist Gary Kelley called The Planets—Reimagined. The video I worked on will be part the multi-media concert featuring the music of Gustav Holst performed by the Waterloo-Cedar Falls Symphony led by conductor Jason Weinberger. The debut is tomorrow night (April 27, 2013) and the hope is that the project will be licensed by other symphonies around the county. It’s been a privilege to be connected with so many talented people. One of the things I learned in the movie 42 was how deliberate Branch Rickey was in integrating professional baseball when he signed Jackie Robinson to a contract—and how much time it took to pull off his “experiment” of ending segregation in baseball. It made me wonder where Branch Rickey came from and the answer turns out to be a small town in Ohio. Rickey was born in Stockdale, Ohio and raised on a farm and educated in a one room school house. He was a devout Christian in the Methodist tradition with a sense of a calling. In a sermon once said that the Lord’s work called for him to bring the first black ballplayer into major league baseball. Rickey graduated from Ohio Wesleyan University and law school at the University of Michigan. He was an officer in the Army during World War 1. He was also a good enough baseball player himself to briefly play major league baseball (and he was also paid to play football in Ohio), but it was his role on the management side in baseball where he would make his mark. He became president of the St. Louis Cardinals when he was 36-years old and joined the Brooklyn Dodgers as president and general manager when he was 62-years-old. When in 1945 he broke the race barrier by signing Jackie Robinson as the first black professional baseball player in the modern era Rickey was 64-years old. And according to various reports it was on his mind since seeing a racial injustice happen when he was in college. Call it the 40 year plan. The take away is you can be raised on a farm in a small town in Ohio and with a little faith, education and persistence–and forty years of patience—you can change the world. In light of the movie 42 being in theaters and introducing Jackie Robinson and Branch Rickey to a whole new young generation, here’s a 1996 TV movie called Soul of the Game written by David Himmelstein (story by Gary Hoffman) and directed by Kevin Rodney Sullivan that gives another dimension to that era. I waited a long time for an updated movie version to come out about Jackie Robinson. Seems like 10 or 15 years ago Spike Lee was talking about doing a film on Robinson. 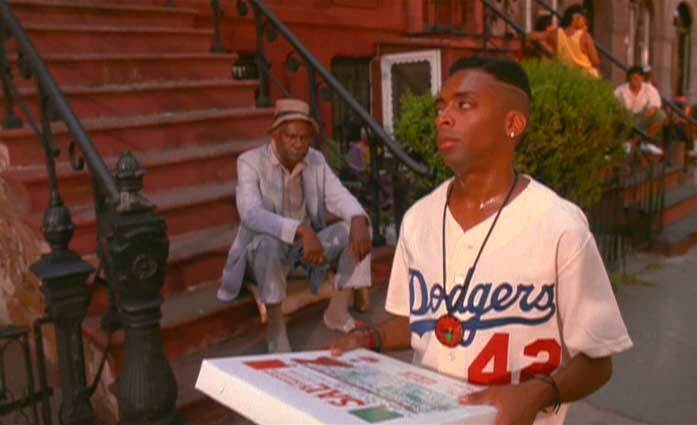 As I watched the movie 42, I found myself wondering what the Spike Lee version of Robinson’s life would look like. Don’t get me wrong, I enjoyed Brian Helgeland’s version of Robinson’s story—when someone asked me about the movie I said the film was a solid base hit, maybe even a double. (A tip of the hat to Helgeland for someone finally getting a film on Robinson made.) Loved Chadwick Boseman as Robinson. Loved the cinematography. Critics have called it “competent,” “decent,” “heartfelt,” “inspirational,” “sincere,” “uplifting” —you get the picture. Rudy, The Blind Side, The Natural, Breaking Away and Hoosiers are all films that found a wide audience and could be called competent/decent/heartfelt/inspirational/sincere/uplifting. In general those were well made films the whole family can enjoy. We need those kinds of films because they represent the world we want to live in. Not perfect, but heading in the right direction. From a producer and studio perspective, 42 is a home run pulling in more than $50 million in its first ten days at the box office. So just about everyone is glad that 42 got made. But I’d still like to see the Spike Lee version. The version that didn’t pull any punches. Less pop, more jazz. But I was also very aware of racial tension. Perhaps that tension is one of the reasons it took so long for a modern telling of the Jackie Robinson story to get made. And I imagine that studios didn’t have confidence that a Spike Lee version of the Jackie Robinson story would top the box office the opening week, or bring any return on the investment. But I don’t believe Spike Lee would have changed that little fact. Because Spike Lee would have been more than curious that 60 years after Jackie Robinson wasn’t allowed to play in a baseball game in Sanford that Sanford would make national news as the town where Trayvon Martin was shot dead. I don’t pretend to know what happened to Trayvon that night and will trust in the courts to find justice. The movie 42 is the American Bandstand version of Jackie Robinson’s life. I just wish we could now watch the Soul Train version. P.S. Check out The Jackie Robinson Foundation. P.P.S. When I was a 19-year-old photojournalist with The Sanford-Evening Herald I photographed Tim Raines in his hometown of Sanford. The great baseball player would go on to earn $35 million dollars playing professional baseball. More fruit of the partnership of Robinson and Branch Rickey. I wanted to write another post on Jackie Robinson and/or the movie 42 but was busy finishing editing a project today so I’ll push the Robinson/42 post back at least a day. 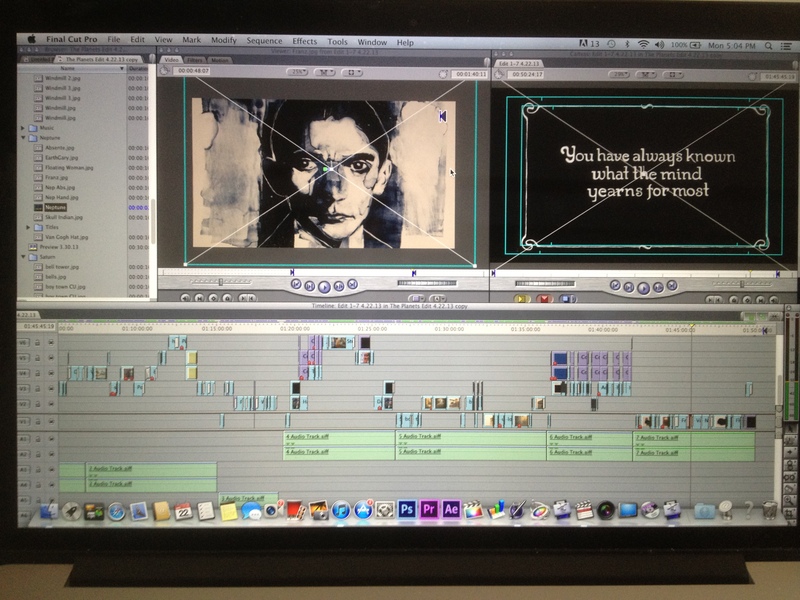 The project I finished editing today is The Planets—Reimagined featuring the artwork of Gary Kelley. 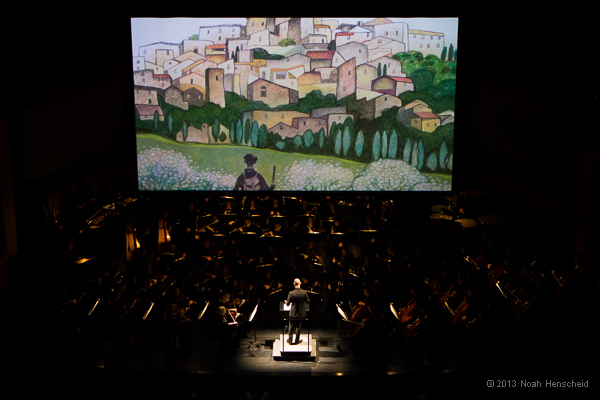 Below is a photo what the project looked like today on the small screen, but Saturday night (April 27, 2013) the video with be projected in HD on a cinema-sized screen at the Gallagher- Bluedorn Performing Arts Center in Cedar Falls, IA with conductor Jason Weinberger leading the Waterloo-Cedar Falls Symphony performance of Gustav Holst’s The Planets.